University of Copenhagen study demonstrates that exercise immediately after learning improves learning retention among children. Children remember better when sent on a run or to play a game of floorball after learning, according to research from the Centre for Team Sport and Health at the University of Copenhagen’s Department of Nutrition, Exercise and Sports. "Physical activity can improve children's memory when done immediately after a learning situation. The greatest effect is achieved immediately after teaching concludes, in combination with intense physical exercise,” according to the study’s primary researcher, Associate Professor Jesper Lundbye-Jensen. Other studies have demonstrated that when exercise precedes instruction, it can spark and sharpen the learning readiness of children. However, when physical activity comes on the heels of instruction, researchers have been able to observe a positive correlation with memory formation, based upon how well children recall learned tasks at a later time. "While neither is more correct than the other, these studies contribute to our deepening understanding of the effects of physical activity, the mechanisms and the various opportunities related to the planning of physical activities for children. In addition to gym classes and the integration of physical activity with teaching, it also makes sense to plan physical activity for both before and after book-learning hours," says Jesper Lundbye-Jensen. The recent study examined the effects of physical activity after a single learning session and was conducted with 77 third and fourth grade students at Bellahøj School in Copenhagen, Denmark. Researchers used a special computer programme to test the concentration ability of children. Photo: Svend Sparre Geertsen. The children were divided into three groups: One group played three-on-three floorball, another went for a run and the control group remained at rest. Each of the group activities lasted for 20 minutes. Prior to the activities, all children engaged in the same learning task, a computer-based precision assignment that was unfamiliar to all. 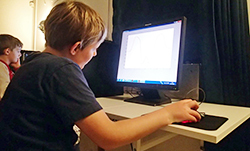 The task required students to use a mouse to follow shapes on a computer screen as accurately as possible. The children were re-tested to see if they could remember how to carry out the task an hour after the task, the next day and one week later. While engaged with the task, children across the three groups improved at equal rates. However, a week later, the physically active children improved their tests ten-percent better, on average, than their sedentary peers. "Obviously, the learning session, not the physical activity, is critical for whether children learn or not. That being said, the ten-percent improvement revealed by our study demonstrates what can be achieved through physical activity, and is certainly worth bringing into the equation. It is the icing on the cake," according to Jesper Lundbye-Jensen, who stresses that the study focuses on the effects of a single learning and physical activity situation, and therefore does not show what might occur over an extended period of time. This is the topic of other studies. The study builds upon experiences from several similar studies conducted with adults. However, it is the first time that this type of study has been conducted with children in their natural learning environment, their school, says Jesper Lundbye-Jensen. "We know that learning doesn’t stop once a learning session ends. It can take hours for the nervous system to establish and anchor memory. Within that time span, memory can be subject to positive and/or negative influences. In this recent study of 10 and 11-year-old children, we observed that physical activity had a positive impact on memory. Previous studies with adults demonstrated that the effect is most positive when physical activity raises the pulse, and when situated immediately after a learning session. If an hour passes before the physical activity, the effect on learning yields less, and if two hours pass, the effect on learning disappears altogether. Of course, the bounty of other positive effects from exercise remain," says Jesper Lundbye-Jensen. Running and floorball are easily implemented school activities according to Lundbye-Jensen. Floorball was used because it was already played at the school, it raises the pulse and the sport is characterized by the fact that children can engage on near equal footing. The study demonstrated that there was an exceptionally high level of intensity when children played floorball. Furthermore, the children drove that intensity. "The only thing we did was to throw the ball back into play when it flew out of bounds. The intensity is driven by small teams playing in a small area. Every player has a large role, which leads to greater individual involvement and activity. We observed that those who played floorball considered the activity to be more fun than those went on a run of the same intensity. The uplifting factor about these results is that activity type was not decisive in relation to the positive effect on memory. I'm thinking, if both activities have a positive effect, why not opt for the one that is most fun?" says Jesper Lundbye-Jensen. An article about the project has been published in "Frontiers in Human Neuroscience", a scientific journal. 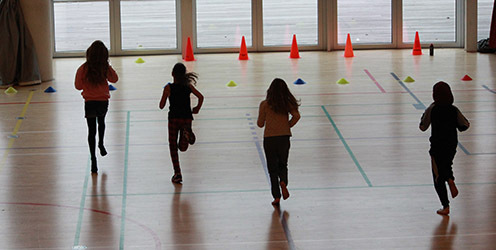 The Department of Nutrition, Exercise and Sports, and the Centre for Team Sport and Health at the University of Copenhagen conduct ongoing research about the relationship between physical activity, motor skills, cognitive functioning and learning. Through consultancy, the Centre aims to translate research into practice to promote well-being, inclusion and retention through physical activity.